This headband is a super cute and simple DIY accessory for the holiday season. A few of these would be perfect for a holiday party photo shoot, or add just the right amount of festiveness on Christmas morning if you don't want to commit to an ugly sweater. I made a set of these for a pre-school holiday pageant — sure to be adorable. Each light requires only a few yards of yarn, so this makes a great stash busting project. Worsted weight yarn:4 yds of each bulb's main color. About 1 yd of bulb base color (black) per bulb. 4-6 yards to wrap around the headband (green). Plastic Headbands. I purchased these in a six-pack from Dollar Tree. Row 1: With main color ch. 2, sc 3 into second chain from hook. Stuff. Change to black color. Fasten off and leave a tail long enough to tie the light to the headband. Wrap the tails of each light bulb around the headband, using a needle to pull the tail through the base of the bulbs. 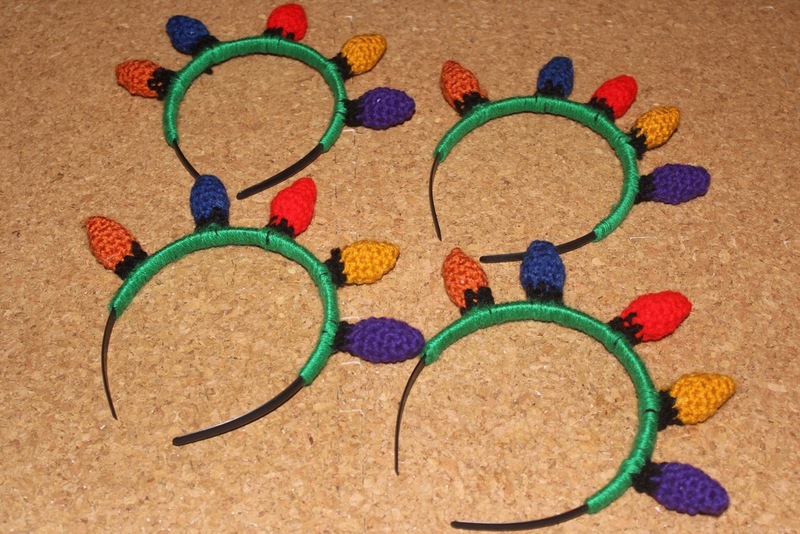 I put five bulbs of different colors onto each headband. If the headband doesn't have teeth it will be easy to adjust the bulbs after they've been placed on the headband. 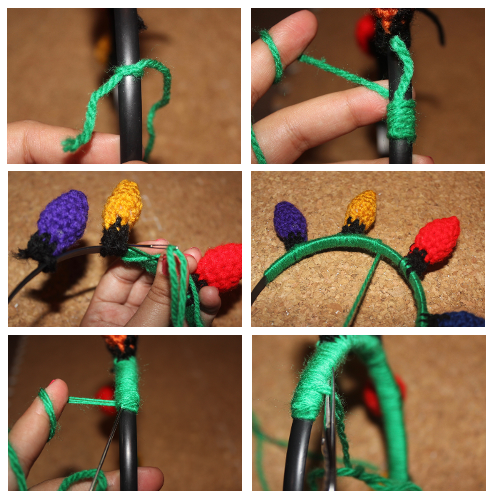 With a long piece of green yarn, tie the yarn an inch or two below the first bulb and begin wrapping up. Remember to wrap around the tail, and any remaining bulb tails, as well so you don't have to weave any ends in the end. Using a needle, pull the yarn through the base of the bulbs. This will secure the bulbs in place. When you reach an inch or two beyond the last bulb, turn and continue wrapping in the opposite direction. Sewing through the bulbs a second time with stabilize them so they aren't so wobbly. Remember to cover any remaining tails as best as possible. When reaching back to the beginning, pull the yarn under and through the wrapped yarn using the needle and snip off the excess. oh, that is so adorable!! What a fun idea. Hello all! I am a knitting and crochet enthusiast from Southern California. I believe that anything can be made from loops of yarn. This is my space to learn, review, and share. I'm especially fond of the bitchface in the center.